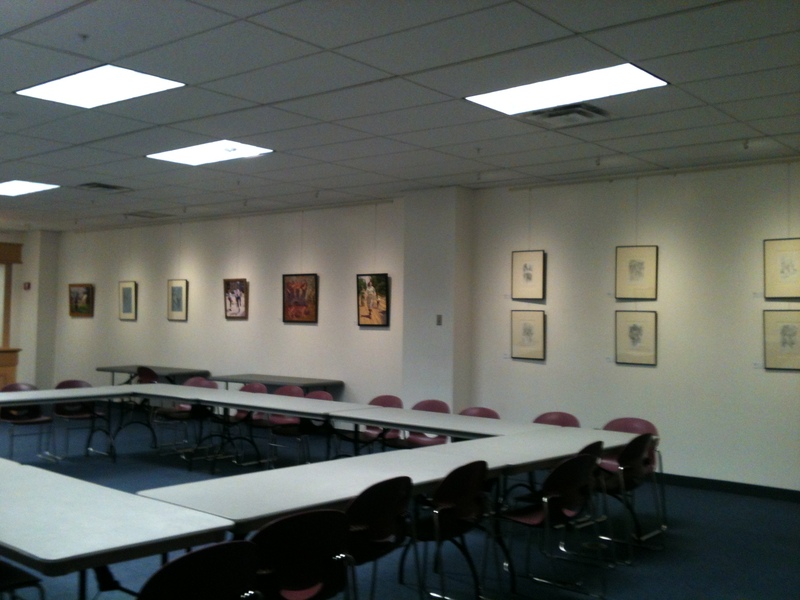 Today I hung a solo show at the Broome County Public Library — it was a LOT of work; I’m pretty tired. But I’m happy with both the way the show looks and the new work I’ve included. public library in Binghamton. The conference room which doubles as the library’s gallery is quite large, and I felt the need for some new pieces to supplement the tried and true. Most of my work is realistic to the extent that it’s clear what objects I’m depicting, so the abstracts are a bit of a departure. Some people are uncertain how to regard abstracts, but here’s my feeling about it: once a non-objective abstract piece is shown to the public, any meaning imbued by the artist is no longer relevant. It’s now up to each viewer to decide what the picture might show, how it makes him or her feel, and what it means. So to promote that ambiguity, I’ve titled all my sketchbook pieces with heteronyms — words which have two or more pronunciations and meanings, with the same spelling. How do YOU pronounce the title? What do you see? What do you feel when you look at it? What does it mean to YOU?